"Who would ever want to play a modern city builder on a console?" is a comment I have heard people ask when they heard the news that Tropico 5 would be headed to consoles. "These games need mice and keyboards and stuff!" Except they don't. Provided a developer gets the interface right, a simulation game works perfectly well on console. 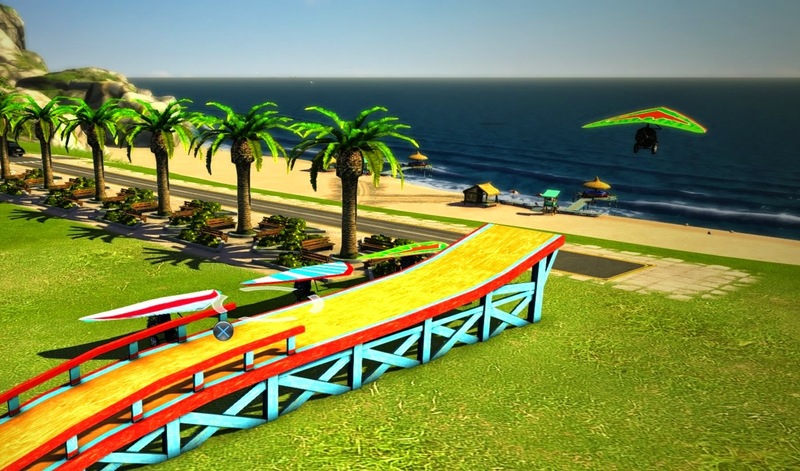 Indeed, Kalypso has already proven that it wants to encourage its developers to think about these things, with a PlayStation 3 port of Port Royale 3 that had be glued to my TV for weeks. Ubisoft produced one of the finest games on the Nintendo Wii with its Anno title. 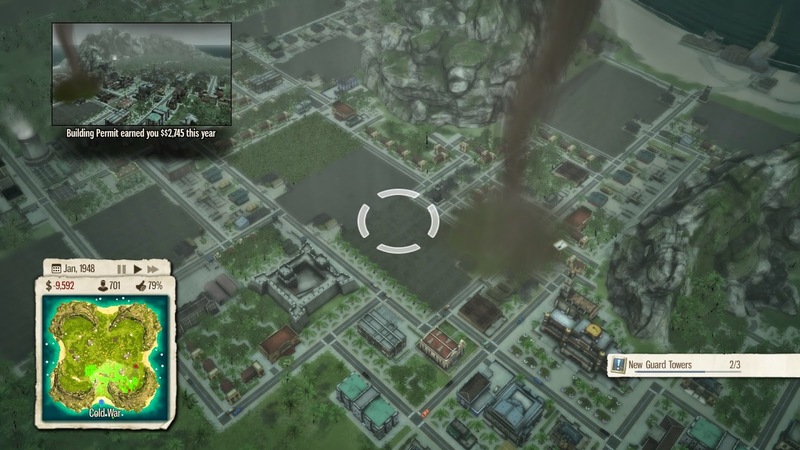 And now the PlayStation 4 has its first serious management sim with Tropico 5, and I couldn't be happier. I will start by stating that when I say Tropico 5 is 'serious,' I only mean that in the context of its underlying mechanics, as opposed to something like Sim City BuildIt or Godus on the Apple iPad, which are simplified to appeal to the more 'casual' mass market. 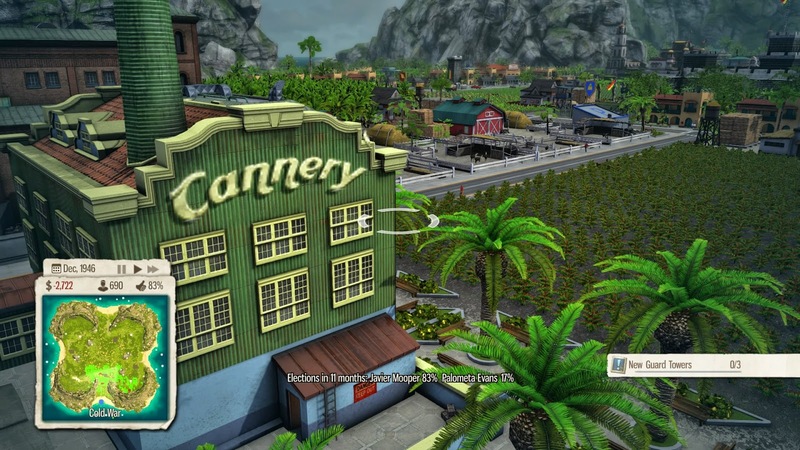 Tropico, the franchise itself, is all about dry (and delightfully funny) humour. In the game you'll take control of an aspiring Castro-like dictator, building your own version of Cuba. Along the way you'll need to forge alliances overseas (to make sure that the Americans don't invade you), figure out how to deal with rebel leaders (assassination is always a useful option, though it tends to distress those around the deceased), ensure that you win an unbroken string of elections (they only need to be free elections if you're stup... happy to lose) and siphon off plenty of money to your Swiss bank account. To build the nation you'll need to think about the typical web of systems that we see in city building sims. You'll need agriculture and mines to feed the people and export for revenue to build houses to shelter them in. People get sick, so you'll need to build hospitals and clinics (which can be free or user pays, if you want to go the full Tony Abbott). Citizens need power, and industry generates a lot of wealth, but that creates a lot of pollution, and that might harm your tourism industry because, let's face it, insane dictator or not, the tourists will come to a tropical island. After all that construction, you can issue edicts to make the people happier or tax them heavier, and then you can alter the constitution to allow a secret police to spy on suspect individuals. Finally, you can research new technologies, which will give you access to airports and the like. The game plays out across four eras, from the colonial times (where people run around with hand-drawn carts), to the modern era (where traffic jams leak pollution into the atmosphere). And as with any good city management game, watching your work and decisions grow a tiny hamlet of a couple of dozen people into a large metropolis is an immensely rewarding process, and Tropico 5 is such a good looking game, both at street level and from a bird's eye perspective, that it's very easy to develop a strong sense of ownership over the city. But what really sets Tropico apart from its rivals is it's deadpan sense of humour. Without letting the jokes get in the way of the gameplay itself, Tropico 5 spares no expense in showing how ridiculous dictators can be. At every point, the game encourages you to be Machiavellian, while also highlighting how humorously odd the world's real dictators would be... if they weren't responsible for all kinds of real evils. Loading screens pop up with little facts about the eccentricities of leaders from North Korea, to Albania, to Zaire, and while I can't verify how true all of these are, they help set the tone for the charming irreverence that dominates the game's aesthetic. It completely welcomes you to see the world as the more crazy dictators would - where you think you're doing good things for the people, but underneath it all life really isn't that grand when you're not in a position to embezzle millions of dollars. I wish more games would approach humour this way. Too often when developers try and make a satirical game, they make the game about the joke, and this means that after you've played it through once (or even just experienced the joke once), then it stops being as funny, and you're left with a game that's supporting something that you no longer care for. Such games don't last much longer after that. But Tropico 5 is a good game that has the humour added on to it. The development team have confidence in the project and so, long after you've reached the point where you're speeding through the funny dialogue or notices, you're still playing, because the foundation underneath is so intensely interesting that it's impossible to put down. In addition to a single player story mode (which is long, and generally quite challenging), there's a multiplayer mode that I haven't even got around to checking out; I'm not especially interested in playing city builders in multiplayer anyway, but it's there for people that want to check it out. More relevant to me is a comprehensive sandbox mode that includes more than enough maps to keep me going for years. The variations between maps are good, too, forcing players to adapt their planning to account for a more arid island, that makes farming difficult, or one that lacks for natural resources. There's a full trading system in place too, which can be used to fill resource gaps, but paying for that requires resources. Related reading: For fans of Tropico, check out Omerta, which was also by Harmimont. Item Reviewed: Review: Tropico 5 (Sony PlayStation 4) 9 out of 10 based on 10 ratings. 9 user reviews.